Volume 10 of O'Connor's Olympians series delves into the myth of Hermes, the trickster god. 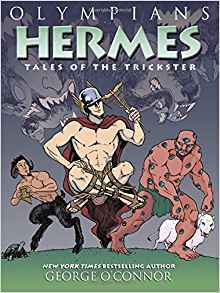 From his infancy, when he bewitches animals and bends them to his will, to his adolescence and adulthood, Hermes' story is wildly entertaining as he brings a little bit of chaos to everything he touches or creates. I've always loved mythology and grew up on it, reading myths from around the world. So when I saw this, I had to request it. Aaah, the joys of reading an ARC. Many of the words and sentences lack spacing between them so theyruntgetherlikethis. Ack. Well over half the text was like that, making for challenging reading. I do hope that's corrected in the final copy since it seriously interfered with the reading. The artwork was meh, kind of blurry at times and lacking in detail though some of Apollo's facial expressions were very well done. The story, now, that was a good one. I'm reasonably familiar with Greek mythology but a lot of the stories and details were new to me, and they were woven into a cohesive storyline with an ending that I didn't see coming. I was pretty sure I knew the identity of the traveler - Nope! I was wrong. :D Most of the stories had to do with Hermes, naturally, since this is his book, and man, infant Hermes was a charming and mischievous rascal. His poor mother! At the end of the book were biographies of some of the key figures in the story, a bibliography, footnotes, and some discussion questions. And yay, I learned more new things! The text was a major challenge to read and the artwork was nothing special (not that I could do any better), but I enjoyed the story, and now I want to see if my library has any of the other books in this series. Like always, O'Connor provides a great list of further reading recommendations and an author's note. This is a fun series for those who are already caught up with Rick Riordan's books and can't get enough of mythology. I love mythology, which is why I picked this up. I haven't read Riordan's books yet, but some day. :) I agree about the reading list and author's note; he did a good job with those.